I think I'm in love - with my ovens - that is. I finally read the manuals and even watched the DVD of the two, jovial chefs demonstrating the many features of my General Electric Advantium Oven. It can speed cook, (which means it can cook real fast - I kind of glazed over during the explanation), microwave, convection bake, broil, toast, warm, and proof. Who knew? I did know it could do a lot, but, wow. I was finally ready to take it for a true test drive. I have always wanted two ovens, but I don't have room, so I chose the Advantium Oven because it gave me a microwave and convection oven in one, plus a whole lot more I learned. I decided to have a little competition between my GE Profile Range Oven and the Advantium Oven. Let the best oven win. 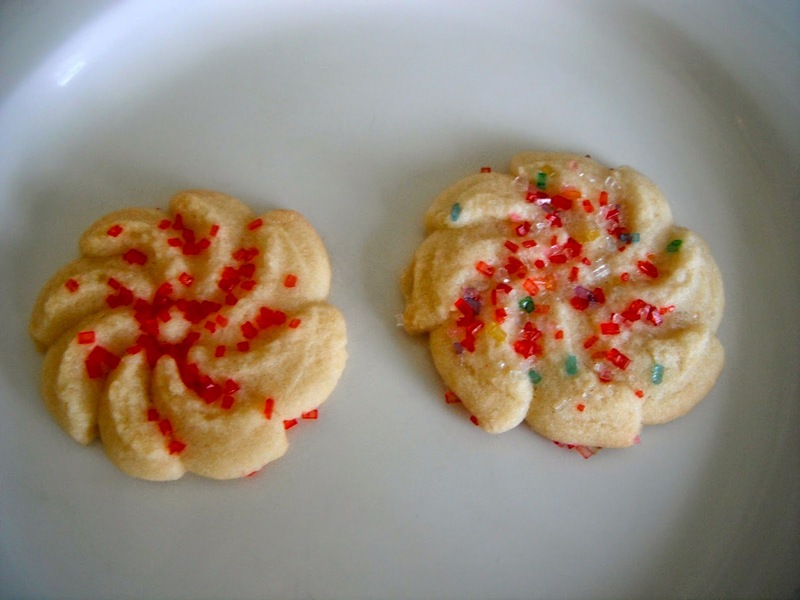 For the battle of the ovens I made Spritz cookies from a family recipe. 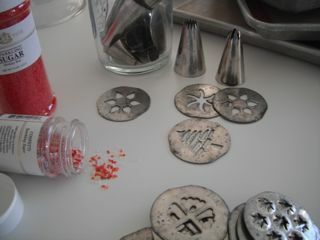 There are only five ingredients, okay six if you count the sanding sugar, so the butter and vanilla are the key players. I use organic, salted butter. 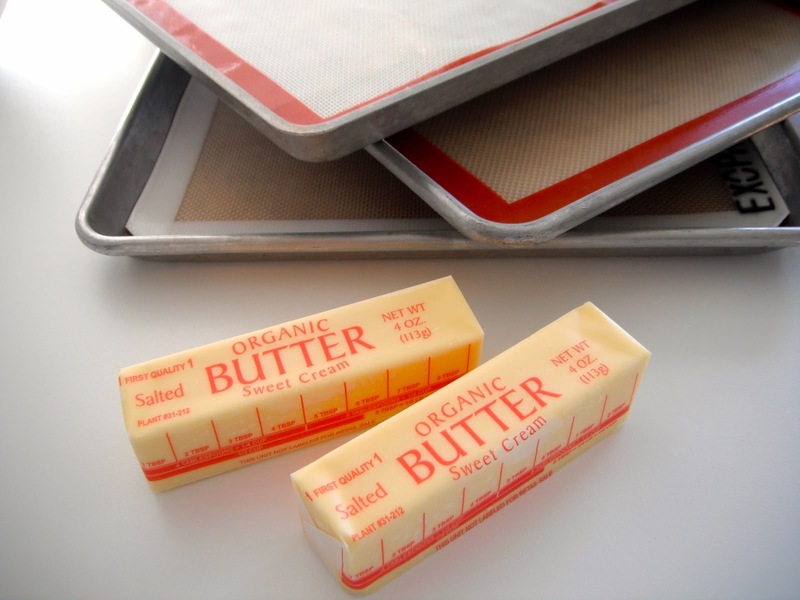 I know in the pastry world they use unsalted butter in baking, but I don't always keep unsalted butter around. 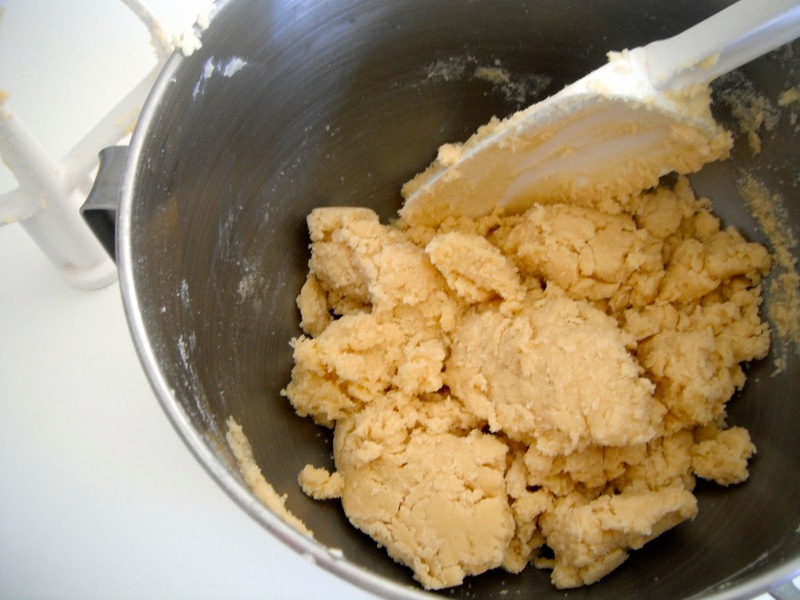 If you are a real purist use unsalted butter and add a 1/4 to 1/2 teaspoon of salt. The vanilla is important, too. 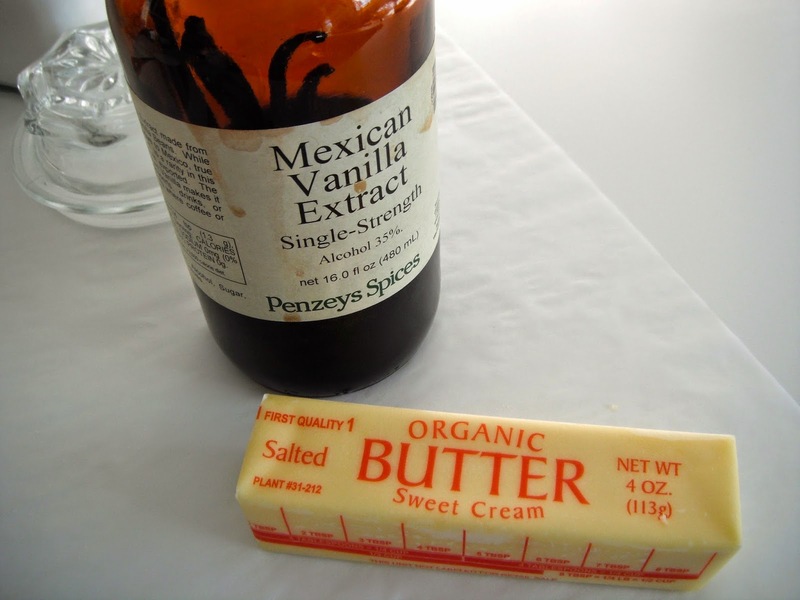 I use Penzeys Spices, vanilla, from a well-loved bottle. In fact, I use all of Penzeys Spices products in my baking and cooking. They have wonderful extracts, herbs, and spices. In my opinion, their cinnamon and cocoa powders can't be beat. I have an old, temperamental cookie press. It can take some practice to get the right results, but you can reuse the dough from any attempts that don't work out quite right. I think this dough is too stiff to use in a pastry bag, but you can try if you don't have a press. I was going to give it a go, but my right hand is shriveled into a claw after writing Christmas cards the past few days. 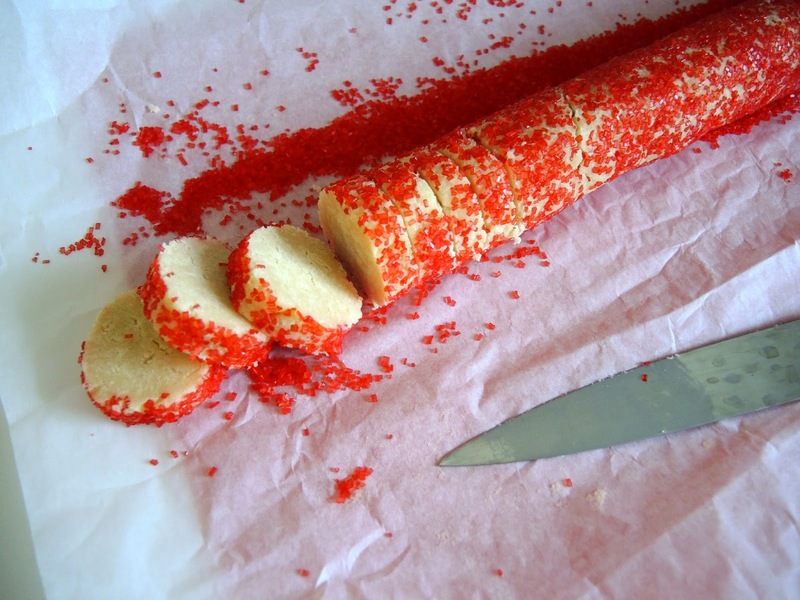 If you don't have a cookie press and you aren't game to use a pastry bag, you can form the dough into a log in parchment paper, refrigerate until solid, then cut into rounds. Bake as directed in the recipe below. I like to use a silicone baking mate to press the cookies on, but you can use a plain cookie sheet if you prefer. It doesn't need to be greased. I tried parchment, but the cookie dough didn't want to release on the paper very easily. 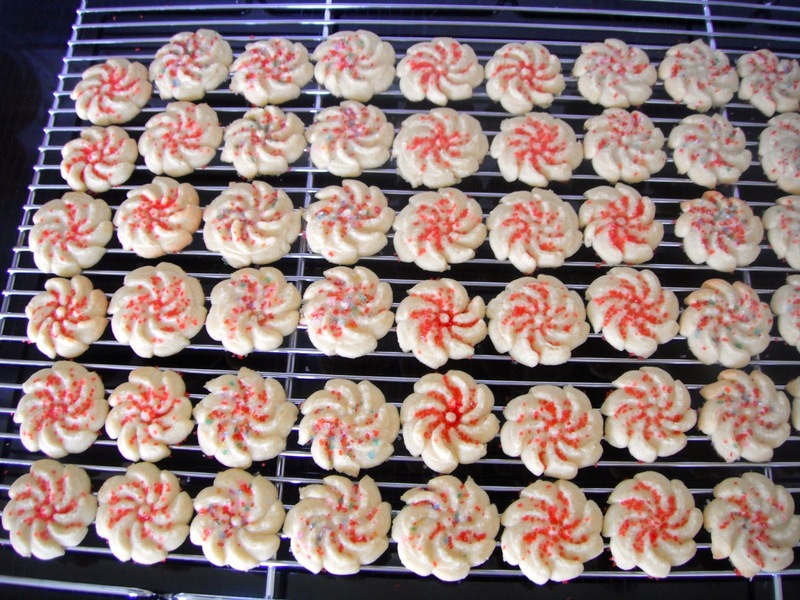 If you freeze the pressed cookies for five minutes before baking they will maintain their shape. If you prefer not to, the cookies will just spread a little. The cookie on the left was in the freezer before baking. The cookie on the right wasn't. 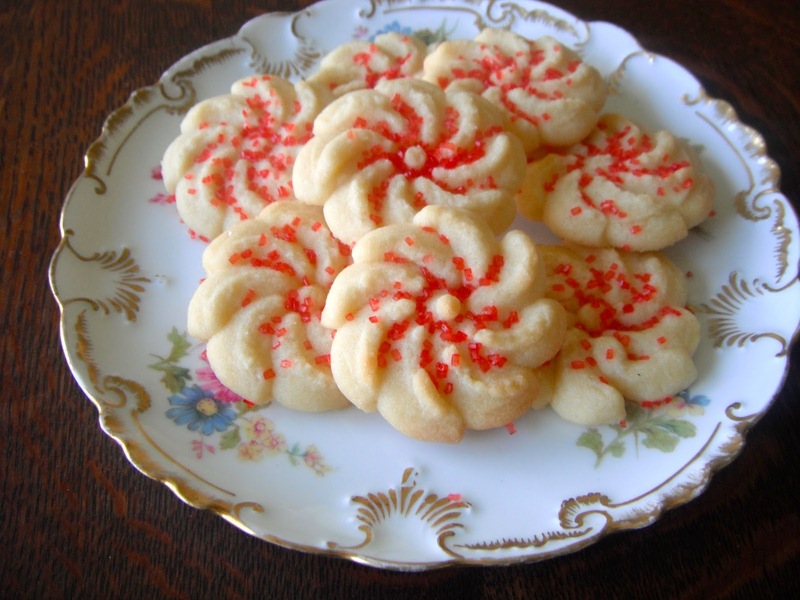 The cookies bake perfectly in 10 minutes in my ovens. But I always set the timer for 8 minutes, check them, then bake two more minutes. Since all ovens vary, I recommend you do the same. 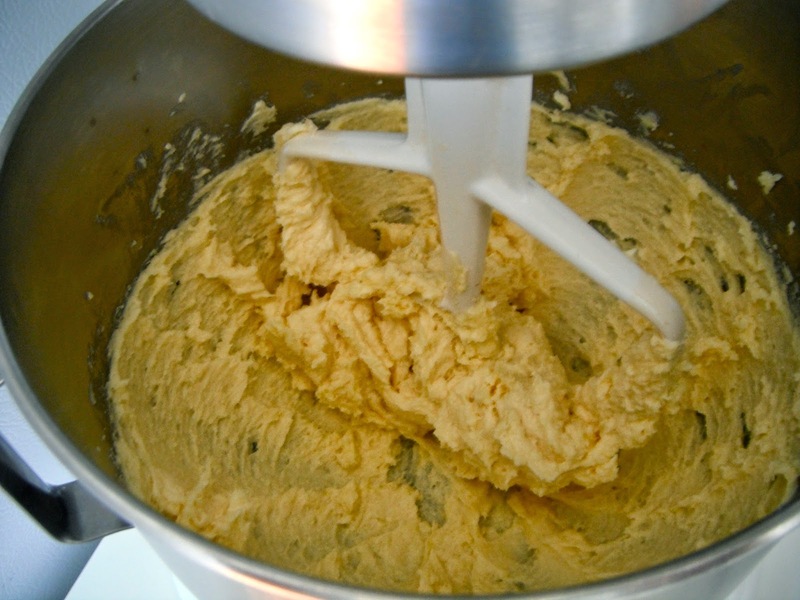 In a mixer with a paddle attachment, cream butter and sugar until light and fluffy. Add egg and vanilla and continue to beat until mixed well. Stop machine and scrap down the sides of the bowl, then mix a minute longer. Add the flour a little at a time while running the machine slowly. 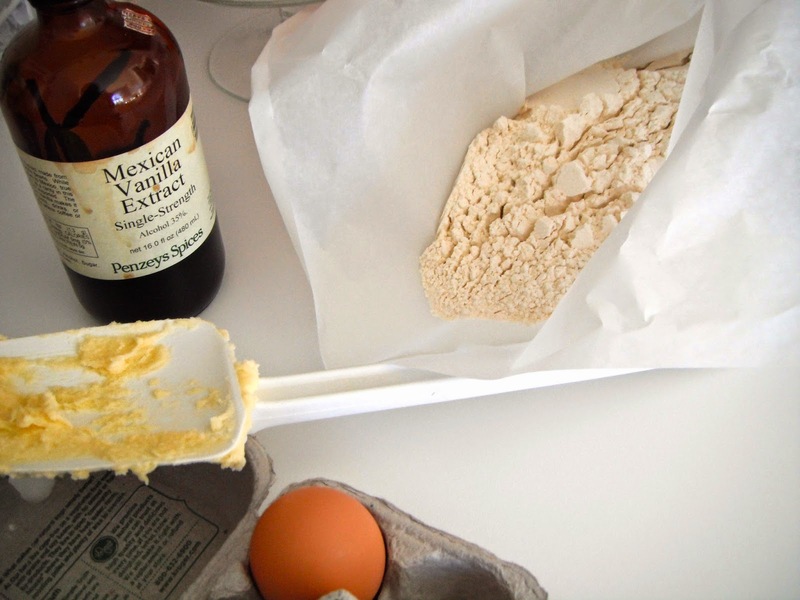 Stop before it is completely mixed and finish by hand with a rubber spatula. 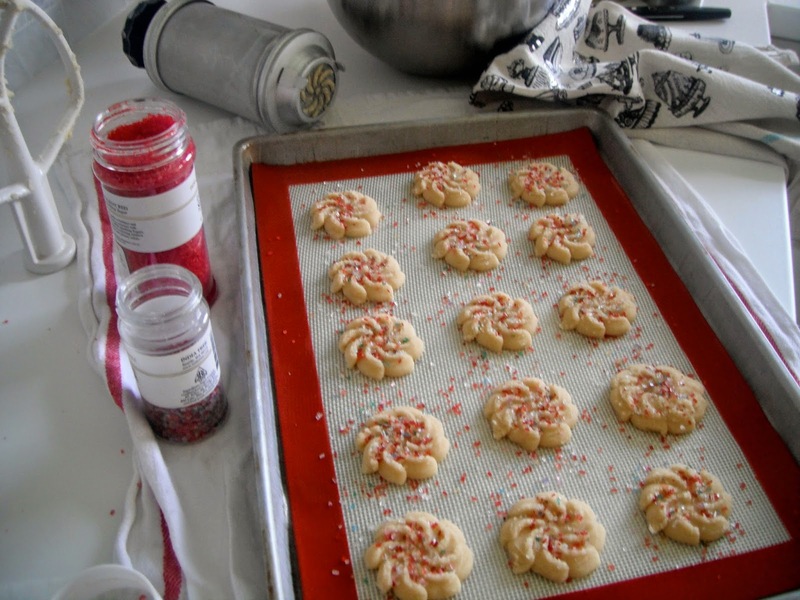 Press cookies onto a baking sheet lined with a silicone baking mat (if using) or a plain baking sheet. Decorate with sanding sugar. Freeze for 5 minutes then bake for 8-10 minutes. Cool cookies on a rack. 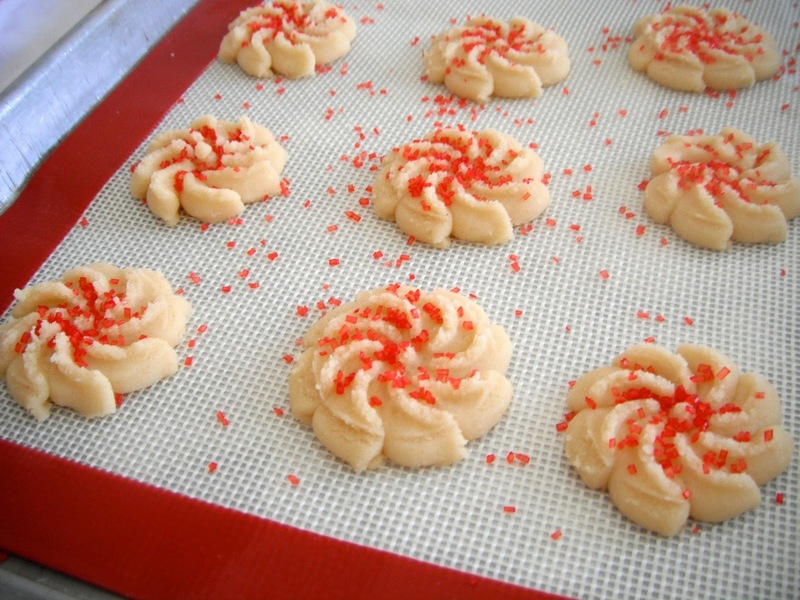 The cookies will keep for several days stored in an airtight container at room temperature. The ovens were waiting on me, not the other way around, which is usually the case. Both ovens baked the cookies perfectly. I have never made cookies so fast and efficiently. They look and taste the same. In the name of research, I tasted (okay ate) a cookie from each batch. There was no difference between the ovens. The competition was a tie, but really it is a win/win for me. Two great ovens - one lucky me.